Dentures or dental implants are a common solution for people with missing teeth. They can significantly improve one’s quality of life when cared for properly. 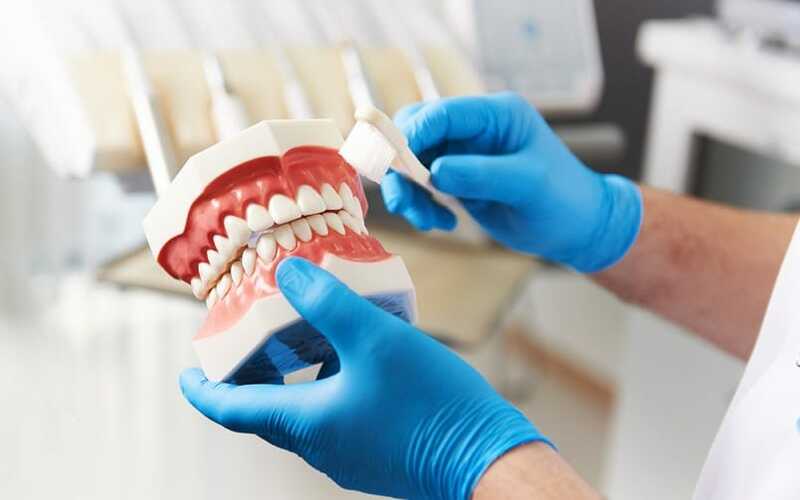 At Smile Denture and Implant Clinic, we always remind our patients that taking proper care of dentures is paramount as well as cleaning dentures propely. This is because poor oral health and poor dental hygiene are major risk factors in full-body health. Therefore, keeping your dentures clean is crucial if you wish to maintain good health. Dirty dentures can be dangerous in multiple ways, from causing an inflammation to your gums to possible deadly aspiration pneumonia. Did you know aspiration pneumonia can result from poor oral health? Aspiration pneumonia occurs when food, saliva, liquids, or vomit is inhaled into the lungs or airways leading to the lungs. This happens instead of swallowing food into the esophagus and stomach. A study from the Nihon University School of Dentistry in Japan looked at the associations between oral health behaviors and the rate of pneumonia in communal living situations of those 85 years and older. The conclusion was astounding – denture wearers who sleep with their dentures are at a higher risk of aspiration pneumonia. Moreover, wearing your dentures at night also increases your risk of inflammation and microbial bioburden. We recommend that our patients always take out their dentures at night, and clean them after every meal. Cleaning dentures thoroughly at least once a day, usually before bedtime is the safest way to ensure optimal oral health. Dentures should always be cleaned with denture cleaners and soft denture cleaning brush to avoid damage. Cleaning dentures daily should be a must, and all denture-wearing patients should remove them during sleep. These simple steps of cleaning dentures and proper care could save lives. If you have any questions about how to take care of your dentures, or would like a free cleaning of your dentures, we are happy to help. You can always give us a call at 613.262.6332 or visit us at our Ottawa Denture Clinic.